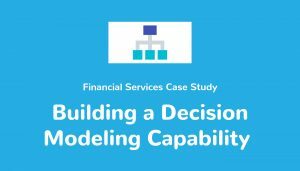 This Decision Management Solutions case study outlines how a major global financial institution broadly adopted decision modeling and the Decision Model and Notation (DMN) standard as their best practice to define decision-making and business rules requirements. Moving forward they are also using decision modeling as a key tool for describing analytic projects to ensure that the analytics developed will be deployed to improve decision-making. Decision Management Solutions provided a decision modeling methodology based on DMN and trained hundreds of people across dozens of projects and geographies. The integration of decision modeling into the organization’s technical and business architecture is well underway and decision requirement models are being developed for a wide variety of projects and business areas.